Some refer to this developmental period as “The Terrible Twos.” We disagree; toddlers are terrific. We love everything about them – their energy, determination and curiosity – and we purposefully created a very special place for your toddler to learn. 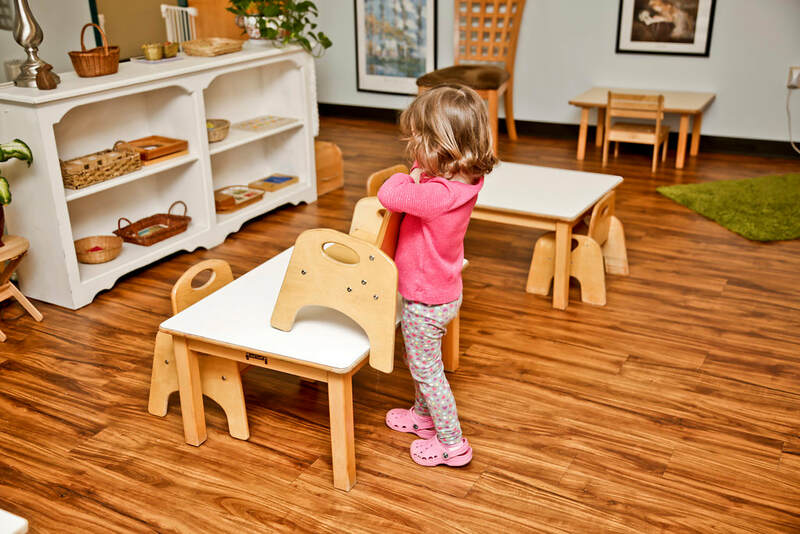 Your child has a natural drive to be independent which we encourage by creating an environment where everything is just the right size for her to do things on her own. Child sized tools that fit her tiny hands allow her to prepare a snack and serve it to friends. A miniature broom empowers her to clean up on her own. ​She is taught the skills of self-care and toilet training. Your child learns a set of concrete life skills and self-confidence – but, more importantly, develops the belief that she can choose to make a genuine impact on her world. Our students grow together into a close-knit, caring community. When children work, learn and grow together, they learn much more than any of them could learn alone. Our bright and sunny toddler classroom is specially designed for your child between the ages of 18 and 36 months. It is a world scaled down to your child’s size. Here, your child paints, cooks, waters the garden, sings songs with friends and plays with materials that develop fine and gross motor coordination. We surround your child with rich and stimulating conversation to support this once-in-a-lifetime period of rapid language development. Your child’s mind effortlessly absorbs the new vocabulary of the environment, which plants the seeds for reading, writing and self-expression in the future. Making first friends and learning how to function within a community is a life-shaping experience for your child. 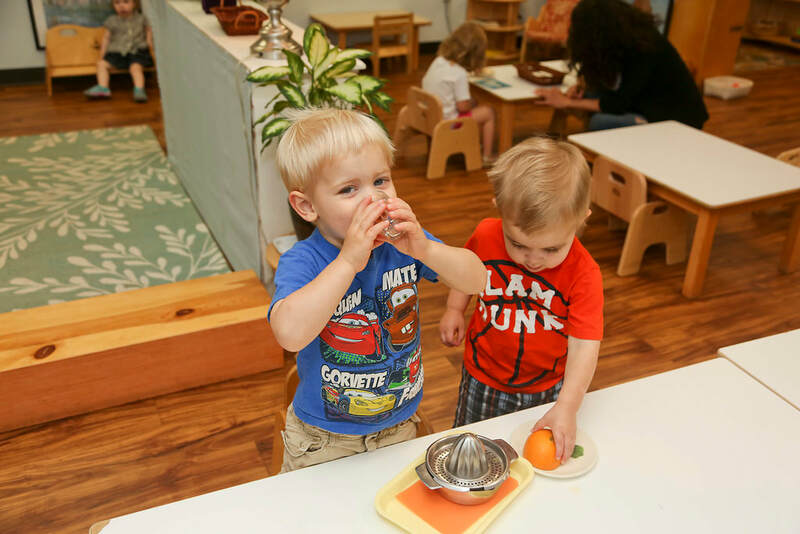 Your child emerges with strong friendships that will continue as she moves through the Montessori curriculum. 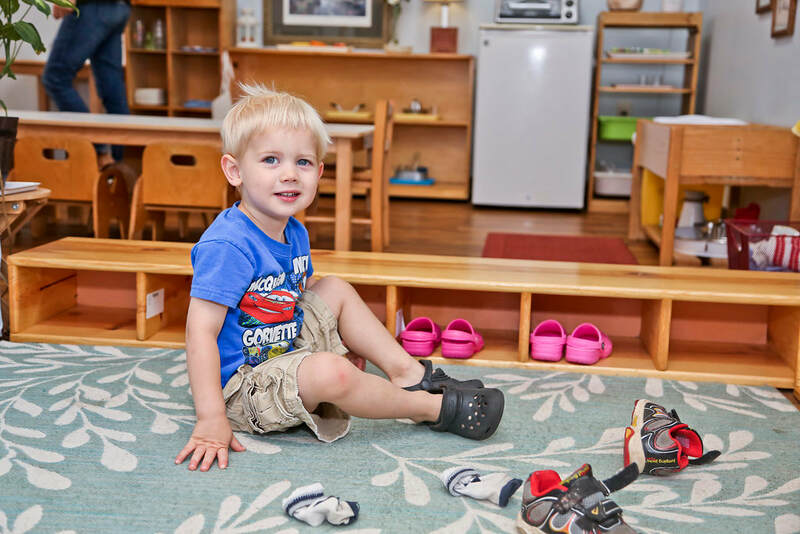 Maria Montessori once said, “One test of the correctness of the educational procedure is the happiness of the child.” Take a peek into our Toddler classroom and you will see children who are happy, engaged and deeply connected to their friends and teachers. As a result, your child develops a deep affinity for school and a true love-for-learning. To be a toddler is to be curious. There are so many things to see, touch, hear, feel and do in the classroom! Beautiful materials that stimulate his senses are rotated frequently on low shelves to pique your child’s curiosity. He is encouraged to move freely around the classroom, to choose activities and explore his own interests. ​​Sometime around 3 years of age, your child’s language skills and self-expression will develop rapidly; he will express a growing confidence in independence and a keen interest in broader concepts; he will want to know what lies ahead, outside of the Toddler Classroom. At this point, he is ready to move up to the Primary Classroom, for children from the ages of 3 to 6.